We arrived today at Dawson Creek, Mile Marker 0 of the Alcan Highway. About 6 miles outside of town, our Check Engine light came on but nothing appeared to be wrong. All gauges read normal. So we proceeded into the campground and the light finally went out. Wonder what adventure lies ahead? We spent the rest of our time in Edmonton visiting some additional "tourist" spots. Since it was raining when we got up Monday morning, decided to catch up on chores, then head back to the mall for more miniature golf. This time we played the "Glow in the Dark" course. It was all painted in bright colors that glowed under black light. Fun atmosphere. This time Fred was the champ. After golf, we hit the IMAX theater for Ghosts of the Titanic. This is a collaboration between Disney and James Cameron. We donned 3-D glasses and watched actual footage from the undersea exploration of the Titanic overlayed with visual effects of life aboard the ship. Very effective. 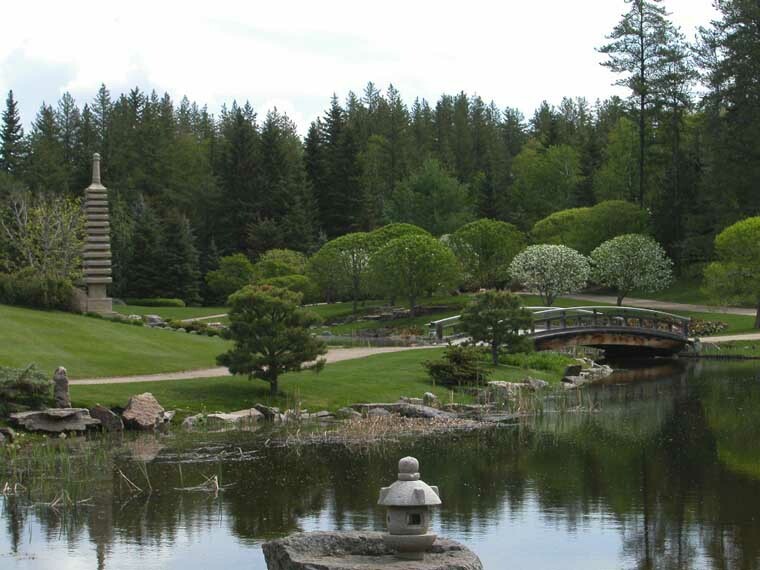 The next day dawned nice and sunny so headed a few miles south to the Devonian Botanical Gardens. The gardens contain a Japanese garden, floral gardens and several wetlands. Unfortunately we were too early to see any flowers as most of the beds were just being tilled and planted. We forget that this part of the country saw snow just a week ago! But we had a nice walk among the trees and ponds. 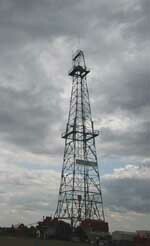 Just down the road from the Gardens is the Canadian Petroleum Interpretive Center. 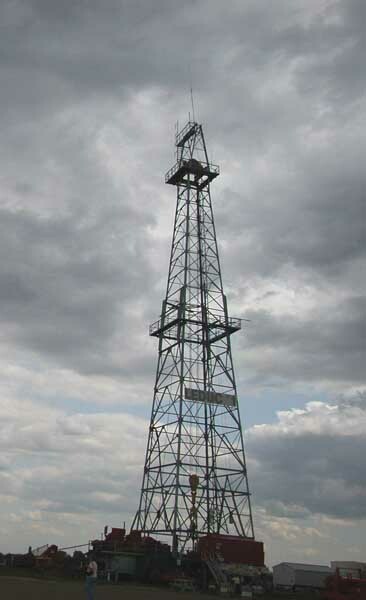 This is the site of the discovery of oil at Leduc #1 in 1947 and is a National Historic Site. The discovery of oil here forever changed the economy and destiny of Alberta. Before its discovery, Canada imported 90% of its oil from the US. Afterwards it became self sufficient. Alberta's petroleum industry is the largest producer of oil and natural gas in Canada and they even export it to the US. The Interpretive Center showed an interesting film called Miles under the Wheat. It was filmed in 1949 and showed how the wheat farmers were persuaded to allow oil companies to drill on their land (they were compensated) with minimal loss of plantable fields. You see acres of fields with oil pumpers dotting the landscape. The most interesting part of the center was the ability to climb on the Leduc #1 oil rig and talk to one of the old-timers who had worked it. Our last day in Edmonton we drove about 20 miles east of the city to the Ukrainian Cultural Heritage Village. Evidently during the late 1800's there was a large influx of immigrants from the Ukraine who were fleeing the oppression and poverty of their homeland. 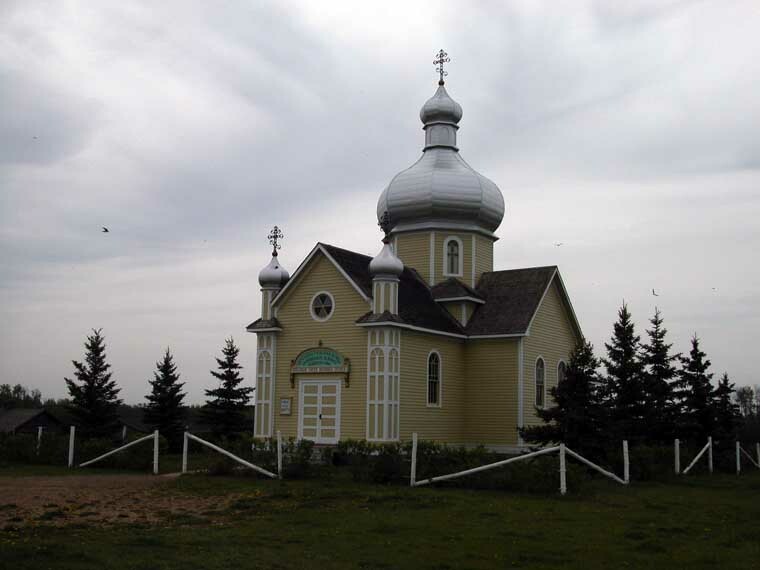 They settled in East Central Alberta and built largely farming communities. The Heritage Village contains actual buildings - homes, churches, barns, stores - from that period. Like other living history sites, costumed staff recreate life during that time. Although it was interesting to learn about the Ukrainian role in Alberta, this wasn't as well done as other living history parks that we've seen. *There are quite a few casinos scattered throughout the city. Not as glitzy as Vegas but some were quite large. *There's a ski area just east of the city with a chair lift. The top of the chair is even with the highway and the hill for skiing looked more like a small toboggan hill. Think we'll stick to Colorado! *Our satellite system stopped receiving once we hit Edmonton. 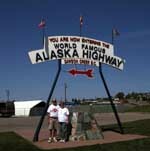 Too far north for Direct TV reception. Good thing we all the final episodes of our favorite shows aired before we got here. *It doesn't get dark until 10:00 at night. That should help the newly planted fields and flowers. LESSONS LEARNED: Some places only accept Visa. Some only accept Master Card. Hardly anyone, except COSTCO, accepts American Express. Unfortunately we only brought Visa and AE. Cash still works everywhere! BTW, the exchange rate isn't as good as last year. We got $1.34 Canadian for our American dollar at the bank.